ACTS 1:8 KJV "But ye shall receive power, after that the Holy Ghost is come upon you: and ye shall be witnesses unto..."
5For John truly baptized with water; but ye shall be baptized with the Holy Ghost not many days hence. 6When they therefore were come together, they asked of him, saying, Lord, wilt thou at this time restore again the kingdom to Israel? 7And he said unto them, It is not for you to know the times or the seasons, which the Father hath put in his own power. 8But ye shall receive power, after that the Holy Ghost is come upon you: and ye shall be witnesses unto me both in Jerusalem, and in all Judaea, and in Samaria, and unto the uttermost part of the earth. 9And when he had spoken these things, while they beheld, he was taken up; and a cloud received him out of their sight. 10And while they looked stedfastly toward heaven as he went up, behold, two men stood by them in white apparel; 11Which also said, Ye men of Galilee, why stand ye gazing up into heaven? this same Jesus, which is taken up from you into heaven, shall so come in like manner as ye have seen him go into heaven. 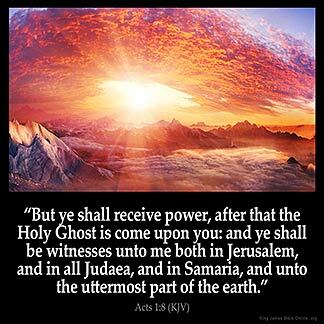 But ye shall receiue power after that the holy Ghost is come vpon you, and ye shall be witnesses vnto me, both in Hierusalem, and in all Iudea, and in Samaria, and vnto the vttermost part of the earth. But ye shall receive power after the Holy Spirit is come upon you: and ye shall be witnesses to me, both in Jerusalem, and in all Judea, and in Samaria, and to the uttermost part of the earth. but ye schulen take the vertu of the Hooli Goost comynge fro aboue in to you, and ye schulen be my witnessis in Jerusalem, and in al Judee, and Samarie, and to the vtmeste of the erthe. 1:8 But ye shall receive power - and shall be witnesses to me - That is, ye shall be empowered to witness my Gospel, both by your preaching and suffering. Ac 1:8 Ye shall receive power. Not temporal power, such as they dreamed of, but spiritual and moral power. Ye shall be witnesses to me. Testify of him of their personal knowledge. They all knew personally of his life, his miracles, his death, his resurrection, and the Great Commission. There could be no mistake. Their witness is true, unless they were deceivers. In Jerusalem. First, in the headquarters of Judaism, the capital of their own country, the place where the Lord was crucified; then in an ever-widening circle from that center; in Judea, then in Samaria, then to the uttermost parts of the earth. This order was followed exactly. It should always be followed in our efforts to evangelize the world. Jesus upholds all things by the word of His power. Tarry in Jerusalem until you be endued with power from on high. God is not going to give Holy Spirit to those who reject Him . Or to any one that will waste His goods !!!! The Holy Spirit is not power ,but He is God Acts5 3,4,9 and the Giver of power.When you receive The Holy Ghost,He gives you power. The power and zeal to witness is to be endue by the Holy spirit. It takes away fear and fill us with Faith, confidence with confirmation of signs and wonders. De verse 8 simply talks about receiving power after the Holy Ghost has come upon you, so as to be a qualified candidate to preach the word of God to others. Thus, if anyone do not believe in the existence of the Holy Ghost I do not think dat fellow is qualified enough to preach to others about the gospel.